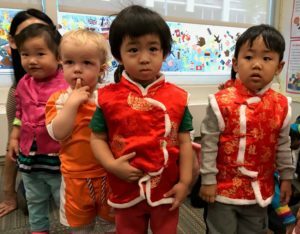 The culture share curriculum kicks off with our United Nations Day celebration, where children wear clothing that represents the country that their family identifies with. Sharing and celebrating each other’s family traditions and cultures is an important part of the curriculum at The International Preschools. Our mission statement expresses that “at The International Preschools, where English language learners are welcomed and supported, children and families from New York City and all over the world share their cultures and gain a sense of international awareness through mutual understanding and respect.” This objective is achieved via a variety of events and activities that occur throughout the school year.